Some thoughts on Noll and Nystrom’s Is The Reformation Over? 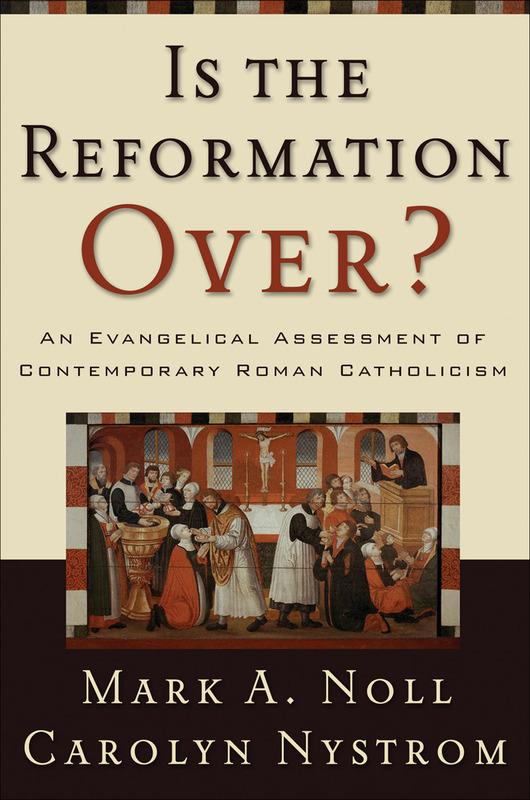 Mark Noll and Carolyn Nystrom’s Is the Reformation Over? An Evangelical Assessment of Contemporary Roman Catholicism (Baker Academic, 2005) is a fascinating read, and has helped me learn a lot more about contemporary Roman Catholicism. The book especially put on my radar the massive role of Pope John Paul II in shaping contemporary Catholicism, the significance of the Council of Trent and Vatican I and II, the significance of the 1999 “Joint Declaration on the Doctrine of Justification,” the importance of the 1994 Catechism of the Catholic Church (which is the Roman Catholic Church’s official statement on its theology), and the numerous Protestant-Catholic councils that have met over the past few decades for the purpose of seeking unity. From reading this book I have a greater appreciation for how the differences between Catholics and Protestants often boil down to not just differing specific theological positions, but differing ways of thinking about theology. For example, in commenting on the remaining ecclesiological differences between Protestants and Catholics, Noll and Nystrom write, “for Catholics, the church constitutes believers; for Protestants, believers constitute the church” (238). Thus in our dialogues the need for more than mere proof-texting (though that may have a place): we need to work hard at understanding how the opposing view thinks. It seems to me that there are indeed numerous and significant areas of common ground between Roman Catholicism and evangelical Protestantism, and that these areas have become much more evident over the past several decades. For one thing, the Catholic Church has gone through massive changes in the last few generations. In addition to the general broadening under Vatican II and the pontificate of John Paul II, the 1999 Joint Declaration and the second Evangelicals and Catholics Together publication have made it clear that the Catholic doctrine of justification has moved closer towards a Protestantism one (though while sola fide is affirmed in principle, imputation remains a point of dispute, as well as the general soteriological context of the Catholic doctrine of justification, with its view of purgatory, penance, etc.). Secondly, the robust supernaturalism of Roman Catholic theology (e.g., its affirmation of biblical inerrancy, the virgin birth, etc.) makes it a more loyal ally to evangelical Protestantism than hard-core liberal Protestantism. Third, the rise of secularism in the West increases many evangelicals appreciation for the Catholic church’s social conservatism, especially on an issue like abortion. Fourth, the political polarization which once exacerbated Protestant-Catholic antagonism in the United States has melted away the second half of the 20th century (cf. pp. 210ff.). All this has brought about a massive change in Catholic-Protestant dialogue, and its appropriate to revisit this relationship. For me personally, judging Catholic doctrine by the 1994 catechism, I would position contemporary Roman Catholicism within the boundaries of Christian orthodoxy (unlike Mormonism and other cults which deny the doctrine of the Trinity). I can rejoice that evangelicals and Protestants share many of the core elements of the gospel message, such as the deity of Christ and His substitutionary death. I believe that Catholics can be regenerate and Protestants can and should have unity in the gospel with such Catholics. In heaven, Lord wiling, I anticipate meeting Tolkien, Chesterton, Kreeft, Muggeridge, and Pascal (just to name a few). Not so very long ago Catholics and evangelicals looked upon each other as orcs and lefs and were as repelled by orc-speech and elf-speech as it was possible to be. Today, it is more like ents and hobbits, not yet speaking the same language and certainly misunderstanding much that the other says but nonetheless communicating quite well and actually learning from the apparent idiosyncrasies of the other tongue. Might God do even more? Look around. Listen. It is happening right before our eyes and ears. Soli Deo gloria (251). I don’t share Noll and Nystrom’s optimism here, and I think it downplays the significant theological differences which remain between the Catholic church and Protestantism. The issue of the Papacy alone is enough to make continued separation necessary—how could different churches unite under one banner when some believe they must submit to the bishop of Rome as the head of the church on earth, infallible when speaking ex cathedra, and others reject this view as a human tradition without divine warrant? Further outstanding differences include the veneration of Mary, the role of tradition and the church in relation to Scripture as a three-fold source of authority, the number, nature, and role of the sacraments in the life of the church, and traditional Roman Catholic doctrine such as penance and purgatory (both reaffirmed in the 1994 Cathechism). Further, as noted above, important differences on the doctrine of justification remain. While we should rejoice in the common ground we share, its not helpful or wise to downplay these remaining important differences. On pp. 242ff. Noll and Nystrom interpret different developments in the history of the Christian church as necessary cultural adaptations of the gospel in different settings. So first was Eastern Orthodoxy, which adapted the gospel to the Hellenism of the Mediterranean in the 3rd to 5th centuries. Second was Roman Catholicism, which adapted the gospel to European forms of church-state Christendom in the medieval era. Then came Protestantism, which adapted the gospel to the vernacular languages of Europe and the modern era. Finally has come Pentecostalism, which is adapting the gospel to the global south. There is an element of truth in this historical presentation. It reminds me of a metaphor I once heard from a well-meaning friend concerning why some Christians are in the Eastern Orthodox Church: “different kinds of sheep need different kinds of pastures.” In this view, I suppose the splits and divisions throughout Christendom are good things—indeed, part of God’s plan for reaching the world. But in my opinion there are a number of problems with this historical interpretation. First of all, the differences between Eastern Orthodoxy and Roman Catholicism are not a matter of historical succession or adaptation to culture. Many of those differences emerged at the same time in relatively similar cultures—Rome and Constantinople in, say, the 8th century were not such different cities as requiring different versions of Christianity. One thinks of differing views of the extent of the authority of the Roman bishop, or different views on the procession of the Holy Spirit from the Son in God’s triune relations, or different views on what is the acceptable use of icons in worship. The differences here were not successive cultural adaptations, but flat out theological differences that occurred between Christians living at the same time in a relatively similar culture. Second, Pentecostalism is not comparable to the other major developments of Christianity in that it is a kind of Protestantism, not an official break from Protestantism. This relates to a larger point that Carl Trueman hammers again and again in his review, namely, comparing Roman Catholicism and evangelicalism is like comparing apples and oranges, because the former is a specific church with official councils, creeds, rulings, and spokespeople, while the latter is a trans-denominational movement among various kinds of churches. But most significantly, a belief in the objectivity of truth must restrain Noll and Nystrom’s historical interpretation of the development of Christendom, as well as their entire theological discussion, and whenever the conversation becomes specific, rather than vague, this point comes into clear focus. For example, either Mary was sinless (as Rome teaches) or she sinned (as the Protestant churches teach). It cannot be both ways. Either the Roman bishop has authority over the church or he does not not. Either purgatory exists or it does not. Either justification includes the imputation of alien righteousness or it does not. The truth cannot be both ways, and everyone, whether intentionally or merely functionally, takes a side one way or the other. Theological indifferentism is ultimately no less specific than having detailed theological convictions, because everyone has a functional, default theology. But it is often less carefully thought through.